My old high school coach used to say, “There are no moral victories in the game of football.” As you well know by now, the Bearcats fell 40-16 to the #6 ranked Houston Cougars in front of a near-capacity crowd of over 40,000 people at Nippert Stadium. UC led during many parts of the game, into the second half, but imploded in the fourth quarter. Basically the opposite result of their first home game against UT-Martin, the Bearcats played solid for the first three quarters and then handed the game to the Cougars late by turning the ball over. 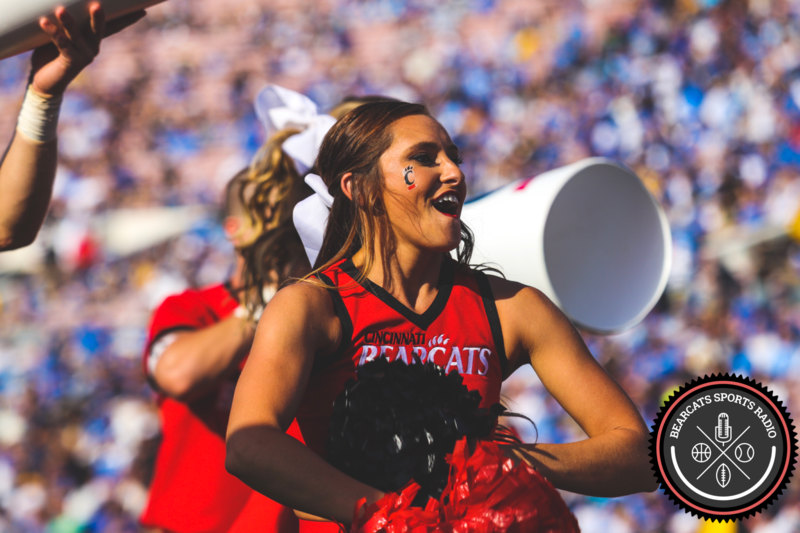 Houston returned two interceptions for touchdowns late in the game, and the Bearcats faithful in attendance collectively groaned, “Cincinnati fans can’t have nice things.” If UC had won, the Bearcats would have catapulted in national prominence. If UC had won, the Bearcats would have again cracked the top 25. If UC had won, the Bearcats would have reclaimed their rightful dominance at the top of their middling, non-P5 conference. If…. UC Student Section was lit. 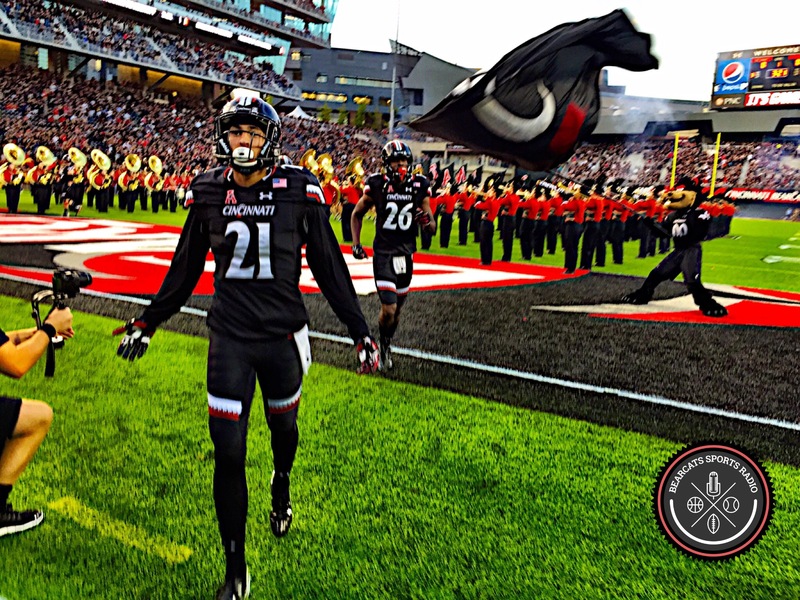 Thursday night did not prove to be the tipping point for the Tommy Tuberville administration. However, the final score did not reflect the story of the game, by any means. UC was not 24 points worse than Houston on Thursday night. And, as a team, I cannot imagine them being 24 points worse than any other team this season. WRs Devin Gray (21) and Jerron Rollins (26) approach the student section at Nippert. 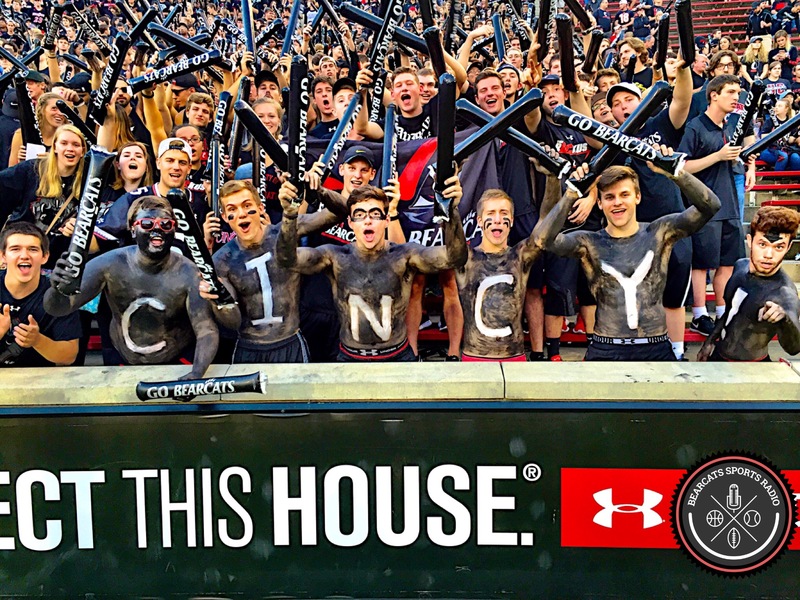 2.16 million people tuned in for Thursday’s game at Nippert. That’s more than the 1.9 million people that tuned in to last year’s Clemson/Louisville game. To say UC was “in the game” until the late-game pick 6s, would be an understatement. My eyes observed that UC outplayed Houston for most of the game, and led 16-12 with 13:34 left to play in the fourth quarter. I have no clue what to make of the quarterback position. Honestly, I’m at a loss. Hayden Moore was the best quarterback during Camp Higher Ground. Ross Trail’s mechanics are sterling, and he might be the quarterback of the future. That said, it’s impossible to ignore Gunner Kiel over there on the sidelines. Kiel has an NFL body and throws the ball better than anyone…when his head is in the game. When the game is not going as hoped, every fan’s favorite player on the team is the backup quarterback – until he actually sees the field. We have seen how Gunner performs throwing 1,000 passes per game under Eddie Gran’s offensive regime. But new Offensive Coordinator Zac Taylor’s approach is more balanced. Does Gunner have fewer meltdowns with a more balanced approach? Is there any way the #1 pro-style recruit of the 2012 national recruiting class remains third on the depth chart? Consider me befuddled. Hayden Moore takes a snap from his own endzone. Mike Boone prepares to pass-protect. Greg Ward, Jr. is good at football; he is a dazzling quarterback to watch up close. He can beat you with his arm or his legs, whenever he chooses. If Lamar Jackson wasn’t having the kind of season he’s having at Louisville, Ward would compete for the Heisman. Unfortunately for Ward and every other elite player this fall, Jackson routinely hurdles defenders and scores about 10 touchdowns a game against P5 powerhouses. Houston Head Coach Tom Herman is a turnaround artist, of Picasso-like quality. He is a special coach, and one unlikely to remain at Houston long term. Nippert shines up better than any college stadium in America. There’s just no stadium quite like it, tucked in the middle of campus and surrounded by beautiful architecture. Thursday night was a hair-raised-on-the-back-of-your-neck kind of night. 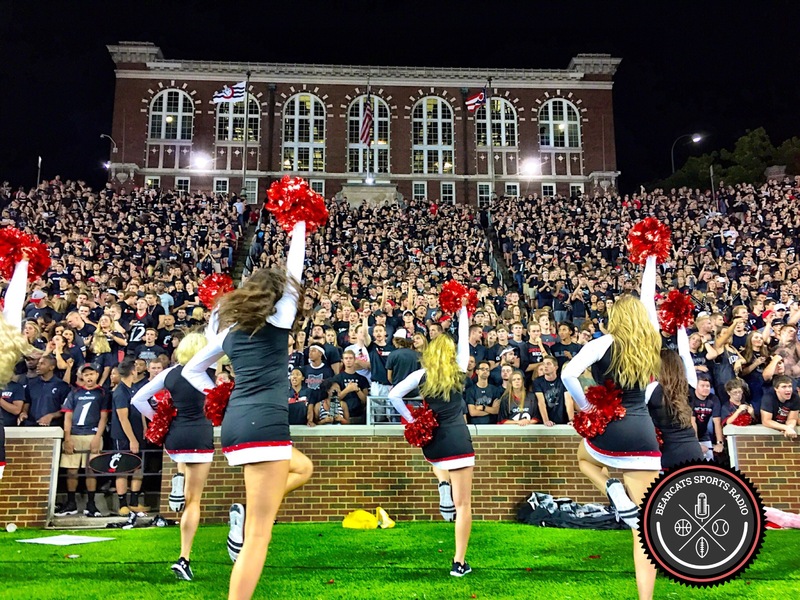 There were 7,813 students in attendance (a Nippert record), and they remained engaged until the game drifted away in the fourth quarter. Many have remarked that UC’s student section outnumbers most SEC student sections. This season is far from over. UC lost to a team that may not lose a game this season. To those fans that are calling for heads to roll, I’d advise caution and counseling. Back away from the ledge, breathe into a paper bag, and calm down, please. I think this is the best UC team to take the field in a while. Is the quarterback position a question mark? Yes. Did we have an epic meltdown in the waning minutes of the game? Sure. Has our defense improved? Yup. Does the offense look more balanced and promising? Uh huh. 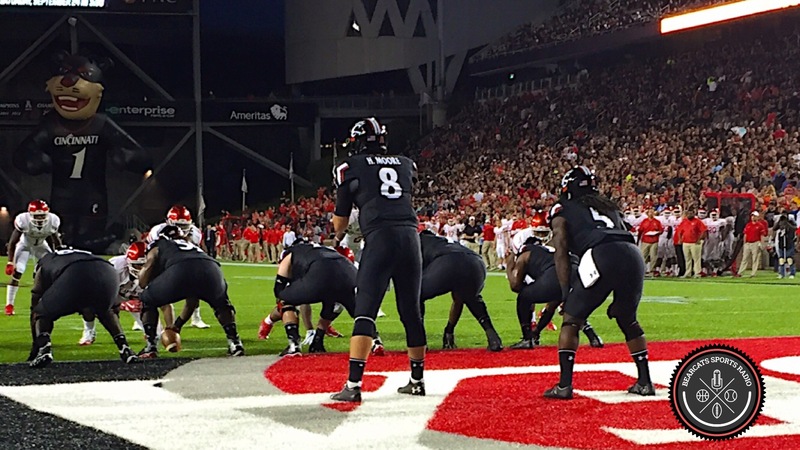 Can the Bearcats rebound and get the season back on track this coming week? I think so. UC plays the Miami Redhawks at Nippert next Saturday. I anticipate a capacity (or near-capacity) crowd and a fun tailgate. Go Bearcats!